The 10 x 8 Loxley Summer House features a contemporary design along with traditional features such as Baltic sourced pine and shiplap cladding, meaning that it would look at home in any style of garden. 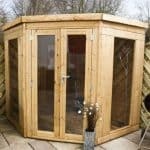 This is a lockable summer house, giving you peace of mind that your belongings are safe whilst not in use. This summerhouse brings a touch of the modern to your garden, with a unique curved roof that allows rainwater to flow off the back, and therefore protects the structure. The 10” x 8” structure is created with 12 mm shiplap cladding, with the added bonus that it is therefore incredibly sturdy against the bad weather. Timber strength is important in a summerhouse, and this unit has Baltic pine as the source of wood. This wood is stronger and denser and therefore hardier against rot. Six pre-fitted windows add to the value. The six large windows make the interior incredibly light, creating a bright environment for you to work, relax or play. 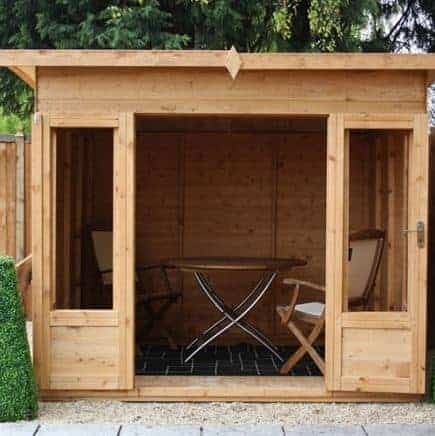 The summer house is supplied in natural Baltic source pine which will blend into the backdrop of your garden effortlessly. Should you wish to make a feature of your summer house or simply would prefer a different look there is the option to receive a free wood treatment in a colour of your choice. When choosing a summer house you may have a certain use in mind for the space; maybe you would like an outdoor dining area or a small work space. 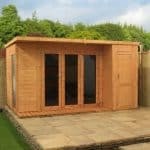 We understand the importance of finding the right space for your needs and the right style and size of summer house to fit into your garden. In this section we take a look at the Loxley style in more detail and see how it could fit your lifestyle. Exterior: The summer house exterior has a unique contemporary design with a stunning curved roof. Constructed entirely from 12mm tongue and groove cladding made with Baltic sourced pine, your items will be kept dry, secure and protected from the elements all year round. 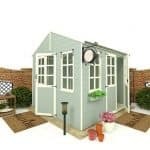 Interior: With fantastic 10x8ft dimensions, the summer house offers a medium sized space which you can put to good use, whilst being compact enough that it will fit into the majority of average sized gardens easily. Windows: There are four slim windows, to both the front and side elevation, giving an all-round light and airy feel to the summer house. A bright environment in which you can relax, work and enjoy the views out to the garden. Doors: The double doors are three quarters glazed and provide a wide entry way for easy accessibility. They open and can be pushed all the way back, giving a nice opening out into the garden, allowing you to enjoy both the views and fresh air. Security: The summer house comes complete with a lock and key for the double doors, ensuring that your items remain secure at all times whilst not in use. 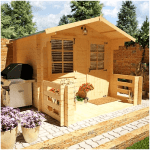 10 x 8 Loxley Summer House: How easy to build? Assembling the Loxley summer house is a straight-forward process for those with even a little DIY knowledge, made simpler by the thorough and easy-to-follow step by step instruction guide. We recommend that two people assemble the summer house due to the size of the parts and for safety reasons. Everything you will need for assembly will be provided within your package; panels, roofing, glazing, fixtures and fittings, all you will need is a basic set of tools. We expect that this summer house could be assembled within a day with a basic knowledge of DIY. 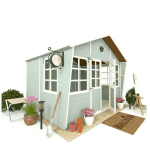 10 x 8 Loxley Summer House: What is the overall quality like? The Loxley style is a wonderful example of how a traditional wooden summer house can be given a contemporary twist to create a building that would look at home in virtually any garden. Constructed using FSC certified Baltic sourced pine, the walls, floor and roof are made up of 12mm tongue and groove cladding to provide a sturdy structure. Baltic sourced pine is denser than regular domestic timber and therefore gives the summer house extra strength. The timber carries a 10-year anti-rot guarantee from the manufacturer on the provision that it is well maintained during that time. The four windows and glass double doors are fitted with 2.5mm styrene glazing which is shatterproof, giving the summer house a light-filled interior and fantastic views out to the garden. The Loxley summer house gives a great first impression with its contemporary styling and unique curved roof. The 10x8ft interior would allow for multiple uses, ranging from a casual dining area to a hobby room. The high quality timber construction is evident and the shiplap cladding gives the building a traditional look and feel. The price for this shed, although on the high side for a summer house of this size, is somewhat justified through the exquisite styling and quality of the building. A must for any garden!